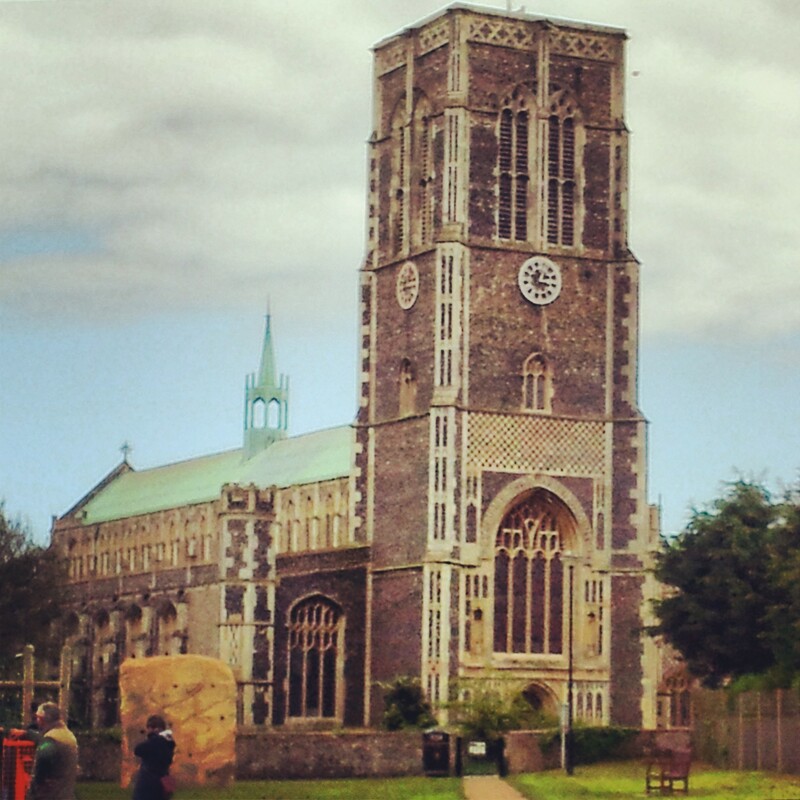 A Day Trip to Southwold, Suffolk – Why Waste Annual Leave? In my days as a junior doctor, I remember one of my most trusted, senior colleagues telling me repeatedly that when he retired, he wanted to settle his roots in Southwold. I must admit that this was the first I’d really heard about this affluent and greatly sought-after neighbourhood in Suffolk, Eastern England but I remained intrigued as to what had inspired him so much to localise his future visions into one small seaside town. At a recent weekend with the in laws, who don’t live too far away from it, the proposal was made for a family trip to head just there. I was game. Besides, a girl knows better than to challenge her mother-in-law 😀 And Pumpkin? Much as he would have loved to stay at home and watch the snooker, the first whiff of the phrase, “family-bonding,” left him in no uncertainty that his presence on our group day out would very much be required. Voluntarily or otherwise. On a predictably rainy British bank holiday weekend, we felt a windchill by the shore as we strolled along Southwold Pier, where the aroma of battered fish and chips seems to carry itself along the shoreline. The beaches are part sandy and part pebbly and the water was a sombre grey but this didn’t seem to stop children revelling in sandcastle building and taking photos of their grandparents in silly poses. There are some sights that paint a picture of innocence and purity, far more than my words every could. Along the pier, you’ll find an underground arcade, a few gift shops, a couple of cafes but most notably for me, a bannister, tiled along its entirety with plaques of memories. Tributes to loved ones and tales of family holidays fill this pier with an intangible warmth. You may remember me telling you that on the love lock bridge in Salzburg, I could have spent hour upon hour reading the padlock messages and the same was true here, had I not been beckoned for cheesy chips. (If you’re not British, you may struggle to understand the novelty of grated cheese on top of chips but trust me on this one.) Ordinarily when walking along a coastline, the sand and sea carry the greatest allure. 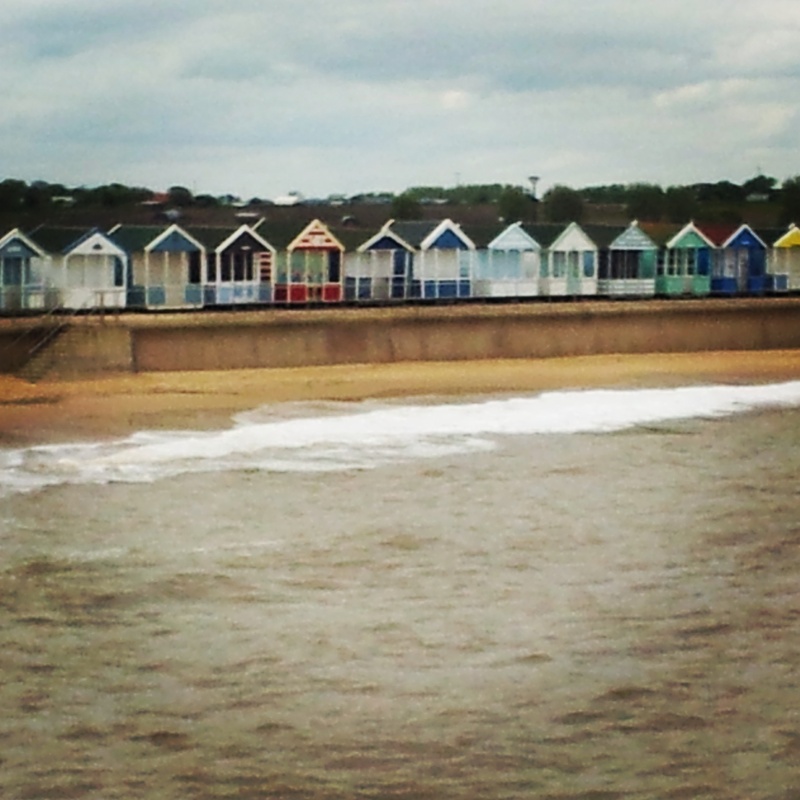 Here in Southwold however, I found myself unable to stop looking at the colourful beach huts that stretch for miles. These can be used by their owners for storage, for rental purposes, as pop up shops or cafes and many were just locked mysteriously. Some stand forth boldly in potent primary colours. Others assume a more back seat role, understated proudly with their neighbours in a palette of pastel colours. It may not have the size or the crowds of some of the bigger seaside piers, such as Brighton, but it certainly had more of a sincerity and intimacy than you would find elsewhere. But if chips and walking aren’t enough of an activity to keep you entertained, you can also walk to the top of a lighthouse – there had been talk of doing this and then somehow, we just seem to have forgotten. 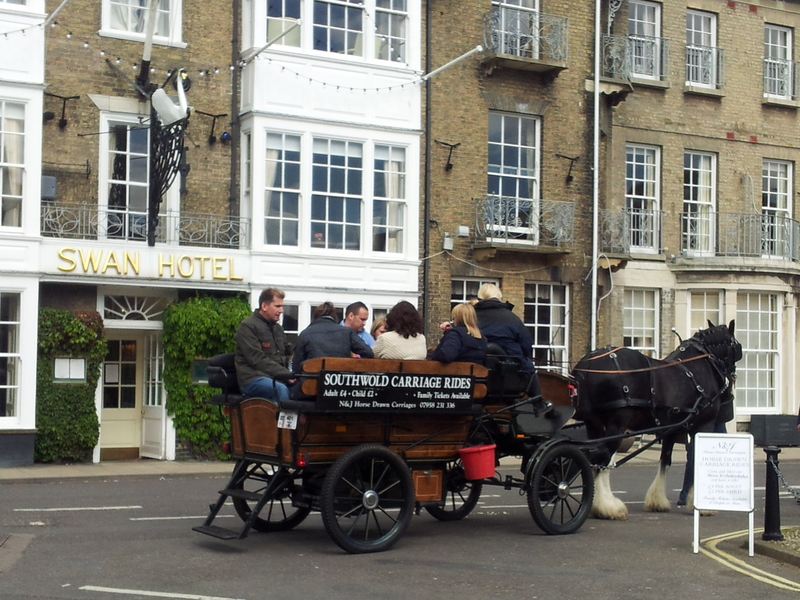 Alternatively, play a round of mini-golf or take a horse-drawn carriage ride around the main high street. It is really the main town area itself more than the pier that I found so charming. 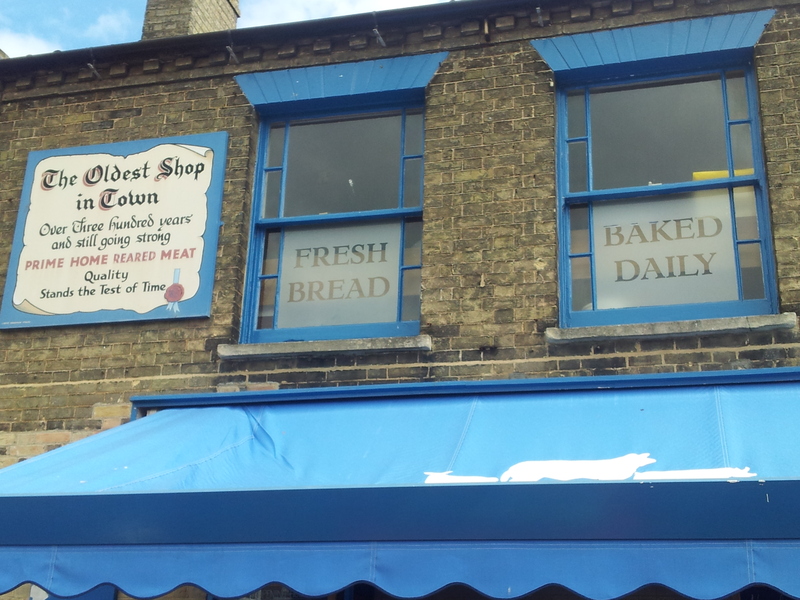 With everything from a village deli, a community pharmacy celebrated by its loyal customers, several tea rooms and a cellar selling local craft beer where you can take a brewery tour, this small street felt quintessentially British. I always find it a bit of a heart-sink finding chain stores in places like this, finding their intrusive conglomerate presence an eyesore on small communities and I’m pleased to report during my short walk around, I only spotted one, paying tribute to the popularity of the local independent traders and the customer loyalty they must generate. While the family marched on, Pumpkin and I cheekily stopped at the Black Olive Deli to indulge in a flavoursome sausage roll in perfectly flaky pastry as a pre-lunch snack. Unfortunately, the jar of chocolate dulce de leche, which I was so excited to find, fell on the floor after only two minutes in our possession, hugely disappointing for me if you know how much I have grown to love the stuff after visiting Argentina. 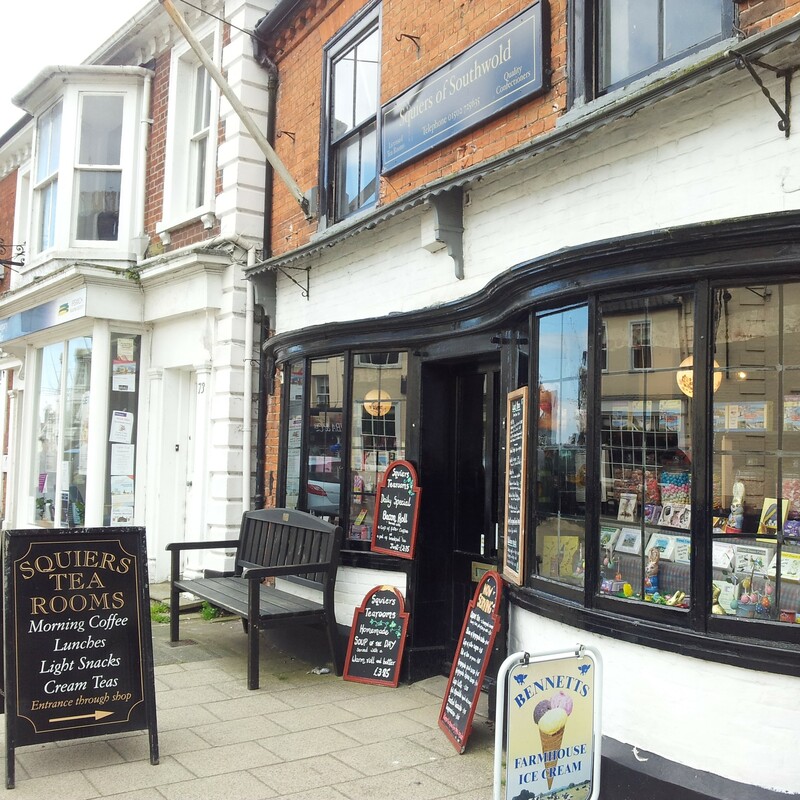 There are one or two eye-catching retro sweet shops on this road, the most charming of which has to be Beaches and Cream, where the pier views are recreated in the window. But for a welcome mid afternoon tea break (where would we all be without our 4pm cup of tea? ), we headed to Two Magpies Bakery, where the friendly staff served us a selection of gourmet hot chocolate (Pumpkin’s super-manly drink), rose tea and my white chocolate and coconut cake slice to name but a few highlights. 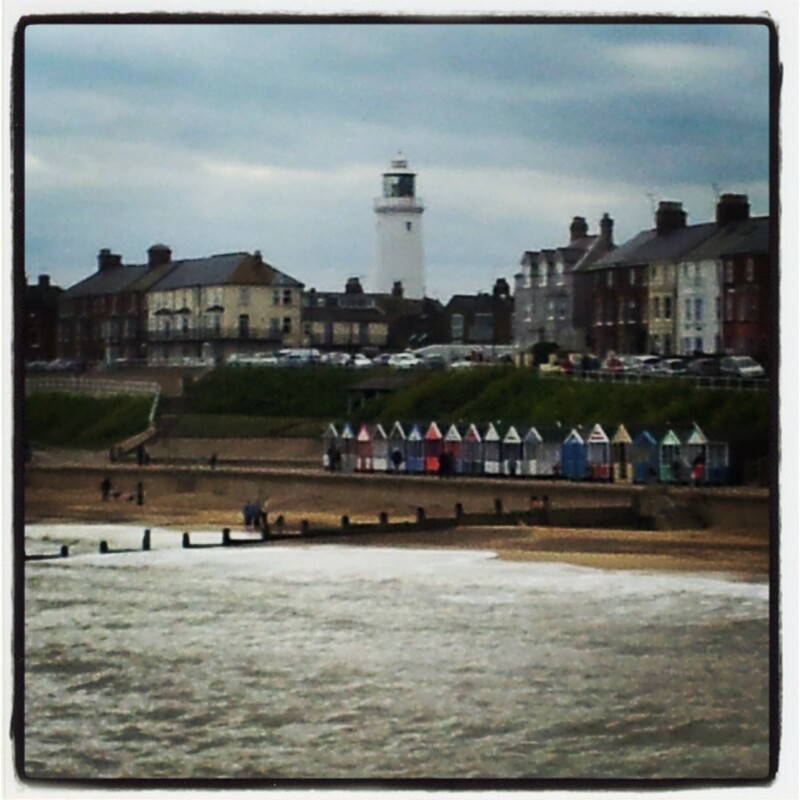 Southwold oozes British retro charm but its bite size quality makes it the perfect place for a day out if you’re in the Suffolk area. And now – finally – I understand why my boss always had his eyes firmly set on the property listings in this beautiful town. Have you been to any English seaside towns? I love Southwold! 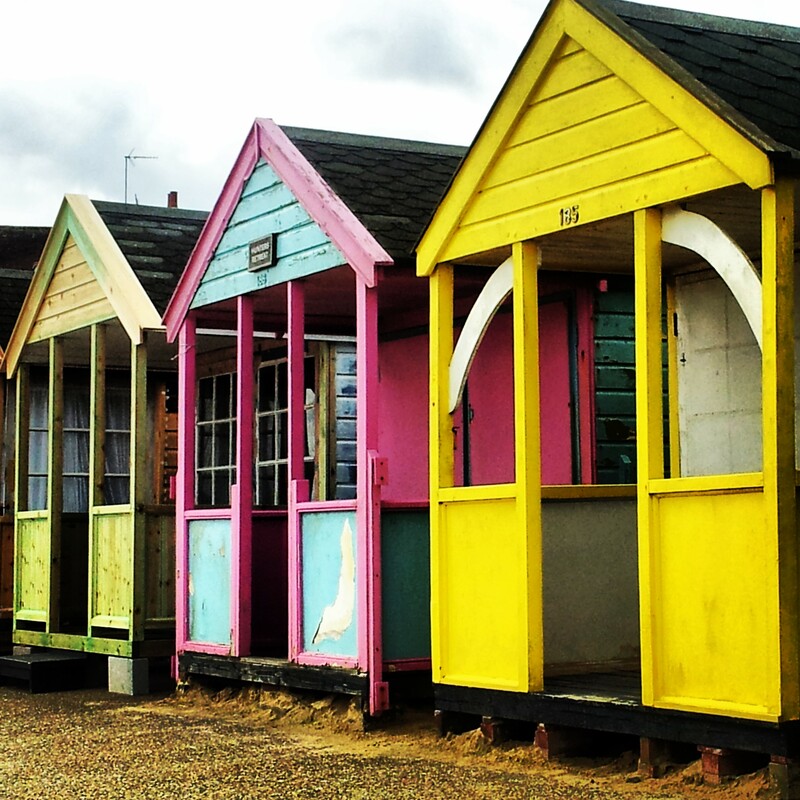 I haven’t been for a long time, but I remember the beach huts looking pretty :). I missed the cheesy chips though – I’ll have to look out for those next time! Thanks Molly! The cheesy chips are one of those really naughty indulgences that you know you shouldn’t be eating but just hits the spot perfectly when you’re a bit nippy by the seafront! Ahh I love southwold! My grandparents are from there so it has a soft spot in our family. We often go back for windswept walks along the beach past the boatyard and fish and chips on the beach. Re your comment about chains, I’m sure I remember reading a while back that a big coffee chain like Starbucks or Costa was planning to move in much to the annoyance of the locals. Cue a load of protests and a plan of action that involved ordering tap water and drinking it very slowly to annoy the managers in the event it did move in. Amazing! It’s a wonderful place to explore in one day. I would love to add it to my bucket list :). Thanks so much for reading Suzanne 🙂 I saw your lovely beach hut snaps on Instagram – Lyme Regis looks lovely – I’d love to head there myself one day! Must have been lovely to have grown up around seaside towns – whenever I go to one, I get that warm fuzzy feeling of regressing into childhood memories! Those beach huts are darling! I would love to visit the UK one day soon! So very typical English. My favourite English south coast town for retirement would be Lyme Regis though, where I could blend in with the other fossils. Thanks so much Catherine – that hot chocolate was every bit as delicious and comforting as it looks – shame it was hubby’s so I was only allowed a sip! I know exactly what you mean about discovering places so near home – in some ways, it’s an even greater sense of magic because a lot of us completely take it for granted when it’s so close to home! I’ve got in-laws in a British seaside town too (In Sussex). These little towns are really charming with their shingled beaches. little stores and beach huts. My kids (who are somewhat insane!) go in the very cold water but I don’t. That water never seems to heat up but that doesn’t stop them from splashing around. I loved it when I visited it! 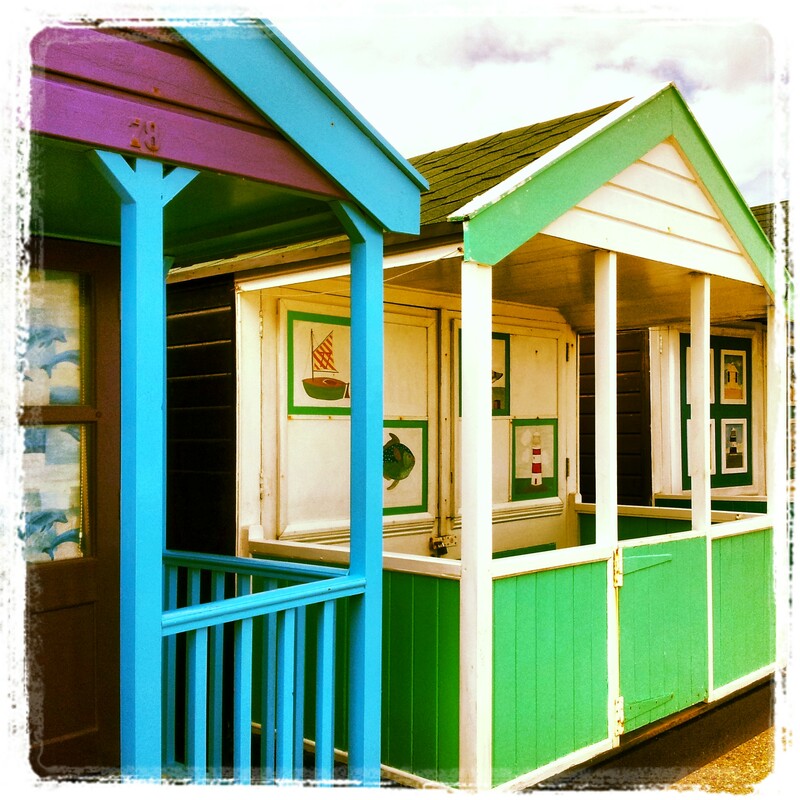 ;) Loved the colourful beach huts!